In my first article Public Private Partnership (PPP): What You Need to Know, I explained the role of Public Private Partnerships (PPP) and their significance in the development of airports. The activity involves consolidating numerous variables, and disparate interests and motivations into a single working framework i.e. the Airport Master Plan. In this article, I will outline the process that enables these variables to be rationalised and how the PPP mechanism is kick-started. An airport Public Private Partnership exercise is a deal-making activity similar in principle to a merger and acquisition initiative. It is propelled forward by certain built-in logic and compelled by an affinity for the asset. There is a seller-buyer relationship with “offeror” and “offeree” interactions. 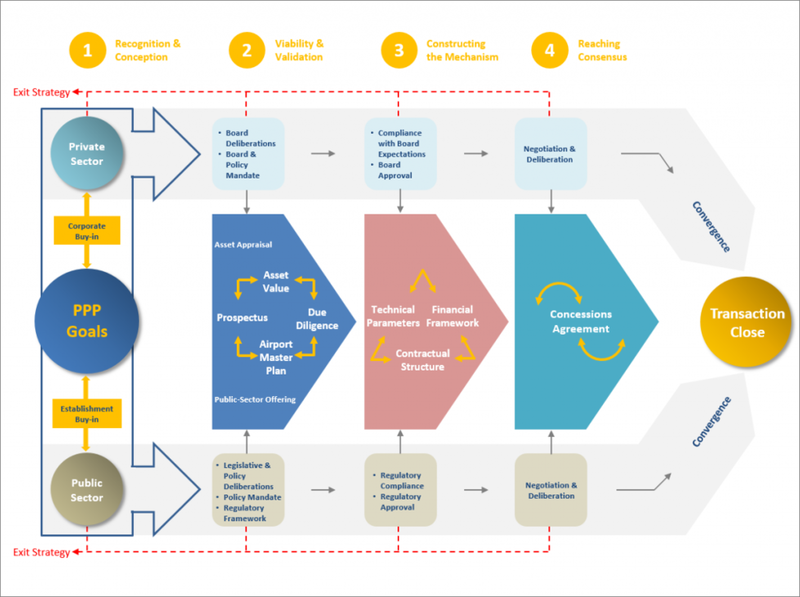 The PPP process is usually a one-off, non-standard activity, and is often supported on both sides by external specialists; legal, financial and technical. As in any sale and purchase interaction, there is tension between seller and buyer that is played out. In the PPP instance, conclusion to the deal-making is marked by a milestone which is designated in this article as “Transaction Close”. At Transaction Close, a Concession Agreement between the parties is signed. The terms and conditions in the transaction will thereon chart the path of the airport’s future development. Transaction Close is therefore pivotal to an airport’s intended PPP development transformation. This point paves the way for the implementation of design and construction activities (or variations thereof), and the structuring of associated financial and legal frameworks. It is also the point for introducing changes in the management and operational regime at an airport. The process of reaching Transaction Close is nevertheless intricate and challenging. Elaborating this in a simple way is the main aim of this article. Getting to Transaction Close may be described as a 4-phase process (see figure). This initial phase is usually seller-driven. An airport’s owner needs to appreciate the particular attributes of their airport as a productive and performance-based asset. The airport needs to internally acknowledge its commercial potential or enterprise value. A comprehensive understanding of these attributes is fundamental in transforming an airport as bait to lure-in investors. Firstly, the operational and performance attributes of an airport asset needs to be articulated. It includes calibrating the airport’s socio-economic significance to the local and wider national economy. This is also the point where mandated Strategic Development Goals (SDG’s) are leveraged into the overall Public Private Partnership strategy. Leveraging an airport’s attributes and articulating its asset value are important. An investor needs information to quickly judge whether an airport can be a viable business proposition, or otherwise. The investor also needs to know if extraneous burdens and risks are within tolerable limits. This represents the public sector offering. Setting this up often requires a shift in the seller’s operational and management mindset. Then a plan needs to be hatched and resources deployed to present the airport as a prospectus to investors. Internal operational adjustments may also be instituted in parallel to embellish the offering. As this is typically a detailed non-standard and one-off activity, the services of external specialists are usually brought in. Amongst the output produced is a comprehensive and integrated Airport Master Plan, that coincidentally also includes an Airport Business Plan. The end result is both parties (seller and buyer) must pick up a compelling belief in the asset’s future potential. Their respective goals in this context must appear tenable. Both establishment and corporate buy-ins are therefore essential; to motivate moving forward and to commit further resources towards advancing the scheme. For a prospective airport investor, acquiring a positive affinity for the airport asset is important. At this stage, the prospective investor must already sense enterprise value in the airport’s operational future. ADB Safegate is a leading provider of solutions that boost efficiency, improve safety, raise environmental sustainability and reduce operational costs for airports and airlines worldwide. With 900 employees and intelligent solutions spanning airside wide over gate airfield and the tower, the company partners with airports and airlines worldwide to increase airport performance, from approach to departure. This stage of proceedings is essentially investor-driven. Mutual interest arising from the parties is formalised through some form of Memorandum of Understanding (MOU). For the public sector offeror, enabling policies, legislative and regulatory frameworks should be suitably deliberated and mandated. Similarly for the private sector investor, Board approvals would be needed as a precondition to proceed. An MOU defines the rights and obligations, and the mode of conduct in further proceedings. This is especially important with respect to the access and exchange of confidential and/or commercially sensitive information. An MOU invariably also describes an exit plan; i.e. the process in which parties may abort proceedings at various stages of inquiry. Formal due diligence and the gathering of detailed information begins here. The objective is to obtain robust evidence to ensure enterprise value exists and can be potentially drawn out from the airport’s future [improved] operations. Amongst data exchanged and examined are all manner of technical, financial and legal information in accordance with the provisions of the MOU. They will study the airport’s facilities and systems, its organisation and human resources structures. There will also be analyses of contractual and commercial arrangements that are currently in place. The quality and presentation of data (i.e. consistency with accepted business best practice) play an important part in catalysing positive affinity towards the asset. On the seller’s side, due diligence entails reviewing the potential investor’s financial standing, including its managerial and technical capacity to fulfil future expected obligations in the airport context. The respective findings of the parties are exchanged and deliberated. For the public offeror, these are assessed for compliance against prevailing policy, legislative and regulatory mandates. For the private investor, the information is checked for compliance against existing Board mandates. Non-compliances arising are further deliberated until revised mandates and/or approvals may be obtained. As data are gathered and parties become more informed, the nitty-gritty starts and the plot thickens. If conditions at this stage appear tenable, the prospects for partnership will gain traction. Gradually, the fabric of a Public Private Partnership will take shape. A satisfactory outcome from the above proceedings will lead to the drafting of a Concession Agreement, the next phase. The foundations of a PPP are formed through the assembly and alignment of technical, contractual and financial variables associated with an asset and its future outlook. Abstract visions and expectations are massaged into solid financial and contractual form that aligns with technical realism. There are many bundled obligations and various layers of sub-components to bind together. Counter-measures against inherent vulnerabilities need to be formulated. This gets rather complicated for airports. There will be constraints imposed by each element, and will infringe on the respective interests of the parties. For instance, technical or regulatory requirements may demand capital commitments that are higher than original investor expectations. Borrowing regimes may be obstructive and workers’ unions require excessive pandering. Or contractual provisions may become too onerous, and timelines stretched, and so on. Provisions are also made to respond to a changing world in the long-term; where established or understood regulations may be vulnerable to political and bureaucratic machinations and change. These risks need to be mitigated and provisions for adjustments and exit strategies need to be put in place. During this phase, tolerances and compromises to entrenched interests are tested, reworked and assessed. Cohesiveness and the spirit of collaboration between parties must prevail to draw all variables and conflicting interests into balanced convergence. From the above, a Concession Agreement is constructed. This is the point where serious semblance of a Public Private Partnership would begin to appear. The Concession Agreement is a pivotal component that formally binds relevant contractual, technical and financial variables together to make the PPP pursuit work. It is a comprehensive document that instructs on the duties and obligations of the relevant parties within the PPP construction. During this phase, the negotiating parties will jockey to establish a strong bargaining position. Both parties will formally define their respective objectives for negotiation and parameters of acceptances. The final aggregation of these elements is the result of repeated cycles of negotiation and deliberation where internal and external variables, persuasive and dissuasive, are all rationalised, to the best extent possible. They normally have to be passed by the Regulatory Authorities (Public Sector) and Executive Board (Private Sector) for formal approval. Assuming the trajectory is positive, deal-making is completed when consensus is reached and the Concession Agreement signed. This is when Transaction Close is attained, and when the Public Private Partnership initiative becomes a reality. The substance of the Concession Agreement will stipulate downstream parameters for the airport throughout the PPP concession period; design and construction requirements, and its future operational and management regime. Along with contractual provisions, financial arrangements are similarly aligned in sync. Its substance (or lack of) is pivotal to the success (or failure) of the entire PPP endeavour. This article paints an overly simplistic picture of an undeniably complex process. There is certainly much of the devil lurking in the detail. The four phases described in reaching Transaction Close do not necessarily play out as distinct sequential activities. Rather they merge from one-phase to another. Often, reversals and backtracking may arise. The path that eventually plays out may be rather contorted and protracted. At the same time, airport development pursuits are characteristically substantial capital items and are operationally complex. Airports are also variously different from one to another in operational character and technical attributes. Their risk profiles are different. Pitfalls are many. Public Sector leveraging of SDG’s needs to be done with judgemental care as do the pacifying of excessive expectations on returns-on-investment. Standard textbook processes may be limiting in this context and may be an anathema to understood sensibilities. As proceedings draw closer to Transaction Close, the dialogue tends to be increasingly dominated by financiers and lawyers. As part of a box-ticking process of elimination motivated by time-cost expediency, it is also convenient for technical aspects to be deemed resolved or “fixed” by this stage. This is when technical elements risk being prematurely marginalised. In an airport environment, interdependencies between technical, financial and contractual are inextricable. Any alienation of technical considerations can unwittingly permeate imbalances and performance vulnerabilities in the critical finalisation of the Concession Agreement. This is a compelling point in airport PPP’s. Garnering cohesiveness and collaboration to advance the process towards multi-party convergence is therefore daunting. Data quality and the nuanced delivery of information matter. Shepherding parties, to commit resources towards a complex activity where the outcome depends upon the solidarity of others, requires a well rounded team, and insightful leadership. Alas, our reality remains imperfect. And perfection tends to be a troublesome beast easily downtrodden by advocacies of distorted cost-consciousness and reckless quick-fixes. In an airport environment, ill-judged shortcuts taken in the name of expediency is indeed risky. Their results can be severely punishing. That being said, insightful and thorough scoping remains doable for a balanced and well calibrated Concession Agreement. With diligence and depth of care, a good Transaction Close for airports certainly remains a viable and worthy goal. I hope this article has offered some clarity in advancing your airport Private Public Partnership intentions or have triggered further thoughts on the subject. Will you leave questions or comments in the area below? Editor's Note: When we published the Introduction to Airport Planning post June 2014, we had no idea that it would be one of the best read posts. So today, I am pleased to welcome Azlan Morad who is writing for us about a hot topic: Public Private Partnership, aka PPP, P3 or 3P. We welcome your comments! Airports that are well and professionally-run generally present themselves as attractive assets. They become even more valuable if they can also make business sense and demonstrate profitability as operational enterprises in their own right. Being both operationally efficient and profitable is an enviable state for a modern airport to be in; where operational capacities are in equilibrium with profit generation; where there is sufficient plough-back potential to make the airport asset self-sustaining and viable as a going-concern. In the context of an airport, this self-sustainability exemplifies “value”; it demonstrates continuity and an airport’s ability to catalyse the local economic multiplier. Balancing operational efficiencies in-line with meeting private investor prerogatives is nonetheless a complex process. This article aims to outline a perspective into this world; of merging private investor/lender interest with publicly-owned airport infrastructure assets. It is an example of juggling intricate variables for transforming airport operations and its ownership into a sensible business proposition. From the underpinnings influencing decision-making, the post also alludes to the use of the airport master plan(see 515 - Master Plans) as a tool; to structure discourse, to help close the trust deficit, and to draw-in group consensus towards reaching transaction close. Reading into the crystal ball of future air traffic growth remains an inexact science. Deciphering their implications for fresh capital to upgrade or replace existing airport facilities requires acute technical judgement. Dealing with risk-averse investor/lenders requires added commercial acumen. In a traditional airport environment, juggling with these issues within a private-sector context is often a departure from airport operational norms. Soliciting specialist input and the use of appropriate tools in these circumstances become compelling. Over recent decades, there has been unprecedented demand for larger airports capable of handling ever larger aircraft and more passengers and cargo. In the 1930’s, a typical aircraft carried about 10 passengers. Today, an Airbus A320 or Boeing B737, the industry’s workhorses, carries around 150 - 170 passengers each. Since the 70’s, with the advent of larger aircraft such as the Boeing B747 (c.400 pax), and latterly the Airbus A380 (c.550 pax), operations and processes at mainstream airports needed rapid scaling up. By 2012, the successful market penetration of Low-Cost-Carriers (LCCs) and the opening up of former Soviet Block countries have dramatically escalated air traffic growth around the world. The overall traffic increases not only demanded physically larger airport facilities but also required more complex technology adoptions, systems and HR specialisation (1). These have spurred airport investments across the globe. In 1995, worldwide cumulative annual investments in airports stood at c.USD 15 bil. By 2015, the annual figure was c.USD 60 bil. Cumulative airport investments by 2025 is projected to be c.USD 80 bil. per annum (2). Airports are traditionally state-owned assets operated as an extension of the government bureaucratic machinery. With dramatic increases in air traffic and congestion, legacy airport stakeholders face unprecedented complications. They often impose heavy demands that could no longer be expediently accommodated within existing bureaucratic structures. Their large investment budgets additionally strain government coffers that also challenge other pressing social obligations, e.g. in housing, health, education, and so on. These financial burdens add unwanted strains to public authorities and have triggered interest in drawing private investment into financing airport infrastructure development. And the Public Private Partnership (PPP) model provides the guidelines to fulfil this aim. Although a sensible proposition, soliciting private money into the realm of public-owned airport assets brings with it a number of issues and complicates the airport development equation. It is no longer enough for airports to operate in a technically compliant manner to fulfil safety prerogatives. To attract private investment, airport stakeholders must now fulfil additional commercial requirements to demonstrate that investment in their airport is “worthwhile”. 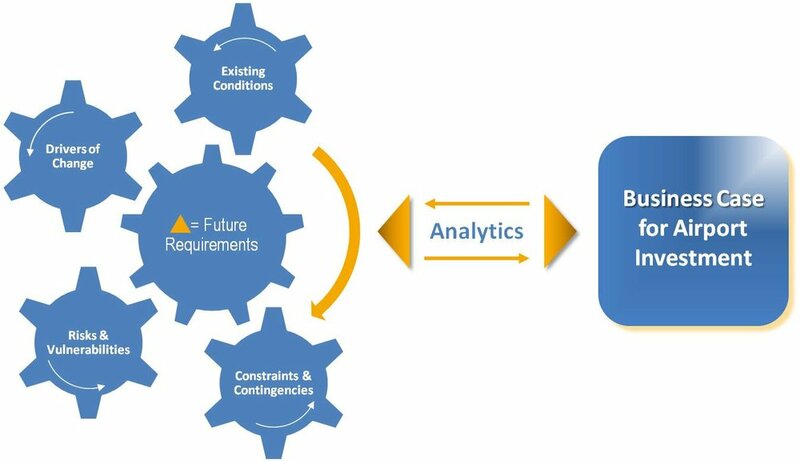 Operational and investment risk can be managed within acceptable thresholds. These are some considerations airport stakeholders and investors juggle with to draw out a business dimension from airport operations and ownership. If successful, the resolution of these issues collectively forms the basis for authorising the release of monies for investment. A comprehensive “big-picture” appraisal is essential to forge critical decision-making (Figure 2). It requires broad-spectrum analyses where numerous technical, financial and legal data are consolidated into a coherent whole. 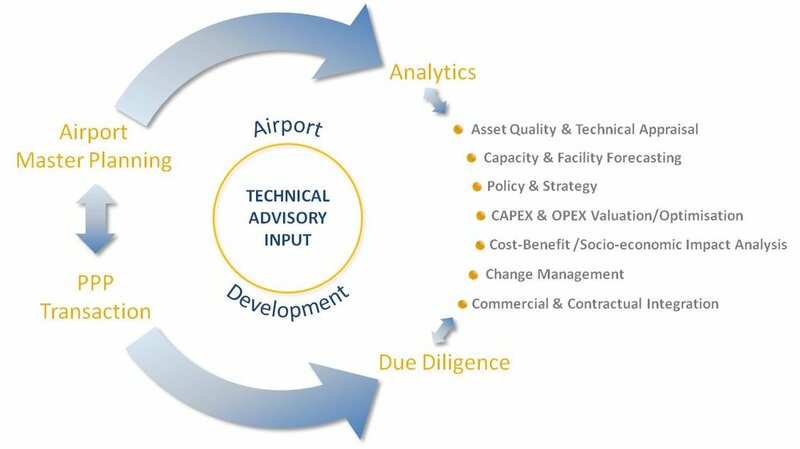 This is the path both airport stakeholders and investors take to reach a comprehensive and balanced plan-of-action. Each of the above headings necessarily carries significant detail intertwined with technical, legal and financial considerations. They document strategies that translate into their airport’s process flows, their facility requirements, technology required, the HR needs and management structures, contractual frameworks, financial statements, and so on. Merging the variables into a coherent whole is challenging. The process of deliberation and negotiation goes back and forth through a range of topics; to garner joint sensibilities, and to eventually distil a final conclusion. Throughout the balancing process, it is important that protagonists steadfastly believe that their goals remain firmly valid and worthwhile. Through this process, key constituents resolve to forge the business case that validates both operational and investment demands. The reality of moving forward is therefore fraught with obstacles and conflicting interests. Bringing together such disparate interests invariably gives rise to complex negotiations. Leadership, judgement, coordination and structured guidance are essential ingredients to overcome conflicts and close trust deficits. It is important that all information be well articulated and consolidated. They need to be brought into a common framework; a shared information dashboard to help structure information and merge ideas; to provide objective guidance and achieve convergence. These are attributes required to reach consensus - a single point where the trust deficit can be equitably closed. The weight of tasks embedded in these processes can be easily misjudged and under-resourced. In simplistic terms, the above is the likely scenario that pans out in an airport Public Private Partnership (PPP) type transaction. As with all trades, a master craftsman uses appropriate tools. And with a measure of competence, s/he knows how to use such tools to extract value from them. From my standpoint, the fundamental tool to navigate public private partnership type airport endeavours towards transaction close is the airport master plan. In deliberations and negotiations leading towards transaction close, the possession of well articulated and credible information lends commonality to disparate parties; it presents a structured path to demonstrate an airport’s bankability as a business proposition. The airport master plan is certainly not a magic potion to cure all ills. It requires setting-up and be well managed. Its misuse however can prove damaging (3). The airport master plan working framework can be substantial. Its scope and interpretation can vary. Harnessing its logic and structure to advantage however requires insight, leadership and knowledge.